Tutorial on how to hook up a PWM Dimmer to your single channel LED Lights. 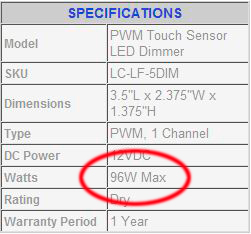 On all of our PWM Product web pages you can find the PWM dimmers maximum wattage load. We recommend never pushing any product to the maximum load but instead leave a 10-15% cushion as to not over drive and damage any of the product. For example, this PWM Dimmer can handle 96W, subtract 9.6W for the 10% cushion, leaving you with a max load of around 86W. See our Power Supply Tutorial to further educate yourself on determining a sufficient power supply for your product. Mainly you must be certain that your power supply is large enough to handle the power load that will be coming from your PWM Dimmer. Once you have determined a sufficient PWM Dimmer and DC Power Supply you can then simply hook up your PWM Dimmer to your LED system. The PWM Dimmer will come after the power supply and will have a DC input for power in from your power supply and a DC output for power and dimming signal to your LED Lights. See the illustration below for reference. If you would like to hook up a large amount of LED Lights to your PWM dimmer, see the How to incorporate a signal amplifier to single channel LED Lights Tutorial.